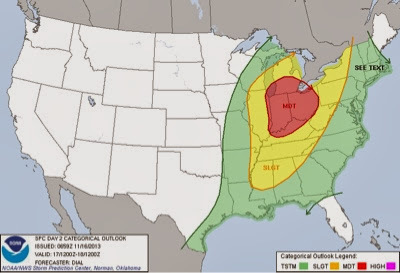 Ohio is now under the MODERATE RISK for severe storms Sunday. The storms will be similar to Halloween, but stronger. The main threat will be straight line winds, but just like Halloween, where Ohio had four tornados, tornados cannot be ruled out. The timing will be late afternoon for Western Ohio and push through Central and Eastern Ohio during the evening. Stay tuned for more updates and be alert.